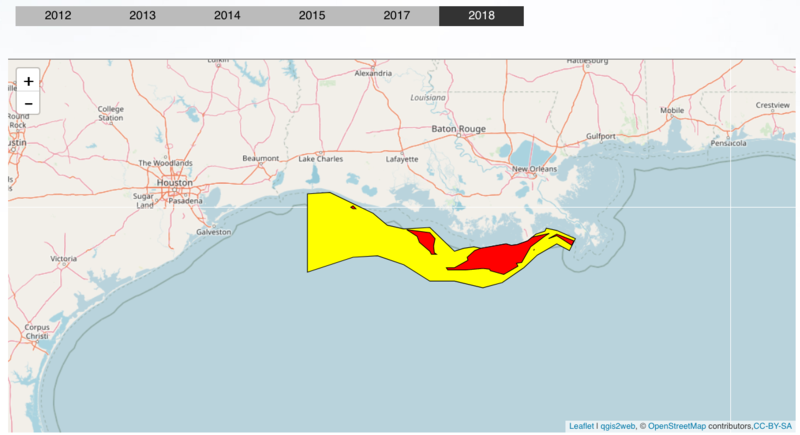 The 2015 "dead zone," an area of dangerously low-oxygen water in the Gulf of Mexico along Louisiana’s coast, is bigger than the states of Connecticut and Rhode Island combined, and ranks as the 11th largest since mapping began in 1985. The news came Tuesday (Aug. 4) as researchers with the Louisiana Universities Marine Consortium and Louisiana State University released results of this year’s measurement. They concluded this year’s dead zone extended over more than 6,400 square miles, more than three times the goal of voluntary federal and state efforts to cut down nutrients that feed the dead zone. That’s also about the same size as the combined islands that make up the state of Hawaii. "It would have been even larger without winds out of the west pushing some of the low-oxygen water back to the east," said Nancy Rabalais, a marine biologist and director of LUMCON who led the mapping research cruise. The dead zone refers to Gulf waters where 2 parts per million or less of oxygen are measured, the standards for what scientists call hypoxia. The oxygen levels are low enough to kill bottom-dwelling organisms that can’t swim away and cause many fishery species, including shrimp, to avoid the area. 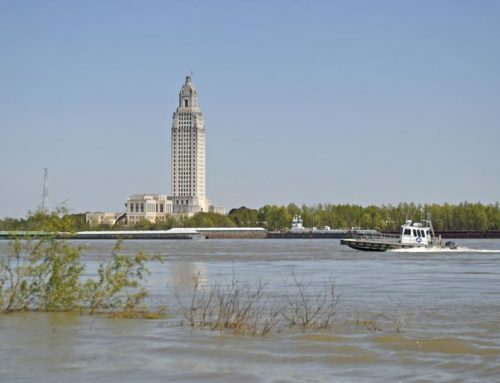 Rabalais said an unusually long period of higher than normal Mississippi River conditions helped form this year’s large low-oxygen area. 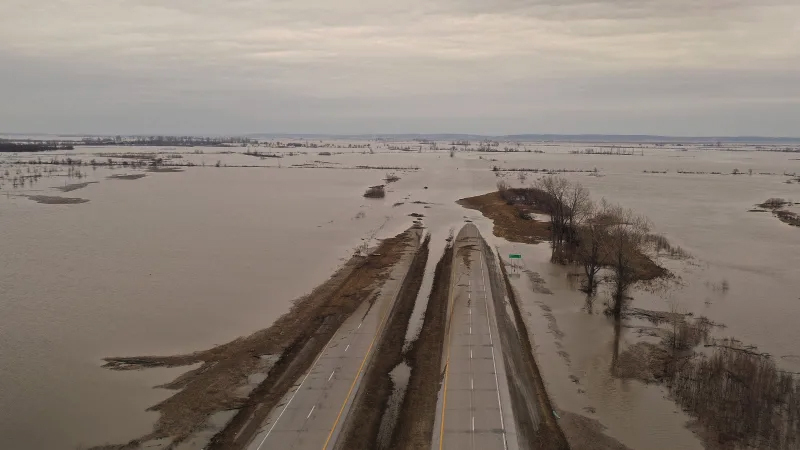 The dead zone is formed in great part by nitrogen and phosphorus used as fertilizer and washed off farmland in the upper Mississippi and Missouri and Ohio river basins. Those nutrients combine with nutrients from sewage treatment plants and septic tanks that are released throughout the rivers’ watersheds. They enter the Gulf in the spring and summer through the Mississippi Delta and the mouth of the Atchafalaya River. The fresh water forms a layer on top of saltier Gulf waters and feeds huge blooms of phytoplankton at the surface. The phytoplankton die and sink to the bottom where they are decomposed by bacteria, using up oxygen in the water during the process. Until a tropical storm or frontal weather systems mix the surface and bottom water, the low-oxygen water stays in place. This year, the researchers found those low oxygen conditions along 6,474 square miles during a cruise between July 28 and Monday. 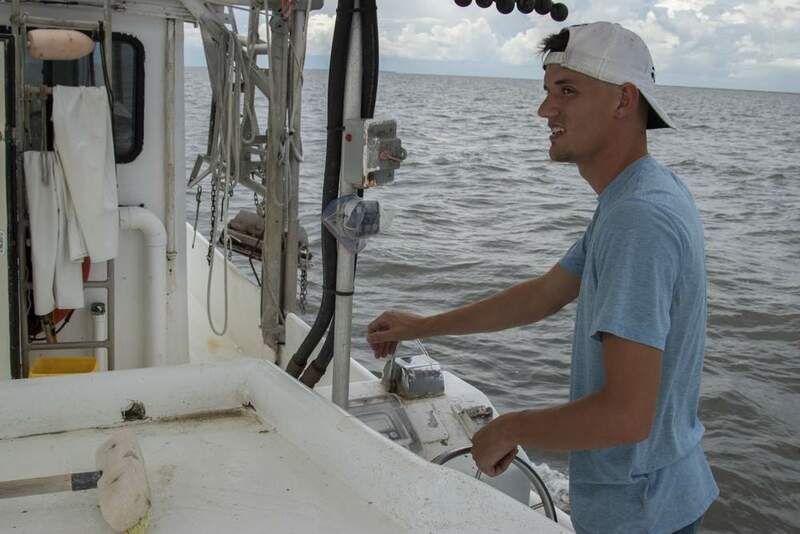 Notable this year, said Rabalais and LSU biologist Eugene Turner, is that a large expanse of the dead zone contained levels of oxygen below 1 part per million, with much of that area near zero, creating a condition scientists call anoxia. "The large expanse of less than 2 milligrams per litter (parts per million) and the waters with even less indicated the severity of hypoxia this year," said a news release announcing the cruise results. "The low oxygen waters also reached well up into the water column, at least on the eastern area of the map." Including 2015, the average size of the low-oxygen zone off Louisiana’s coast during the past five years was 5,543 square miles, which is three times larger than a goal set by the Mississippi River/Gulf of Mexico Watershed Nutrient Task Force of reducing its size to below 1,930 square miles by 2015. That goal was set in 2008 by the task force members: five federal agencies, 12 states and Indian tribes located within the Mississippi and Atchafalaya river basins. They have been trying a variety of voluntary programs aimed at reducing nutrients in the river, through innovative farming methods that use less fertilizer, the planting of grassy buffer strips and wetlands that capture nutrients before they enter waterways, and improvements in urban and rural sewage treatment methods. In February, the task force announced that it had reset the clock for its goal, and would now hope to reduce the low-oxygen zone to less than 2,000 square miles by 2035. "Progress has been made in certain watersheds within the reagion, but science shows a 45 percent reduction is needed in nitrogen and phosphorus entering the Gulf of Mexico," said a news release announcing the new goal. It also said that the task force has set an interim goal of a 20 percent reduction by 2025. Meanwhile, a federal judge in New Orleans announced on July 20 that he will consider new arguments over whether the federal Environmental Protection Agency should increase its regulation of fertilizers and other nutrient pollutants in the river. U.S. District Judge Jay Zainey issued the order in a lawsuit filed by 11 environmental groups after the U.S. 5th Circuit Court of Appeals decided he had to reconsider a 2013 ruling ordering EPA to conduct a "necessity determination" of whether to put in place more stringent rules. The appeals court said Zainey’s new review was to be "extremely limited" and "highly deferential" in considering EPA’s reasons for not wanting to adopt more stringent standards. "The states and EPA need to stop dragging their feet and institute solid goals and timelines to address the Dead Zone and the impacts nitrogen and phosphorus pollution cause throughout the Mississippi River Basin and Gulf of Mexico," said Matt Rota, a spokesman for the Gulf Restoration Network, one of the environmental groups that filed suit. This year’s low-oxygen area also was almost 1,000 square miles larger than a prediction made in May that was based on measurements of nitrogen and phosphorus compounds in the watersheds of the Mississippi and Atchafalaya rivers between October 2014 and May 2015. 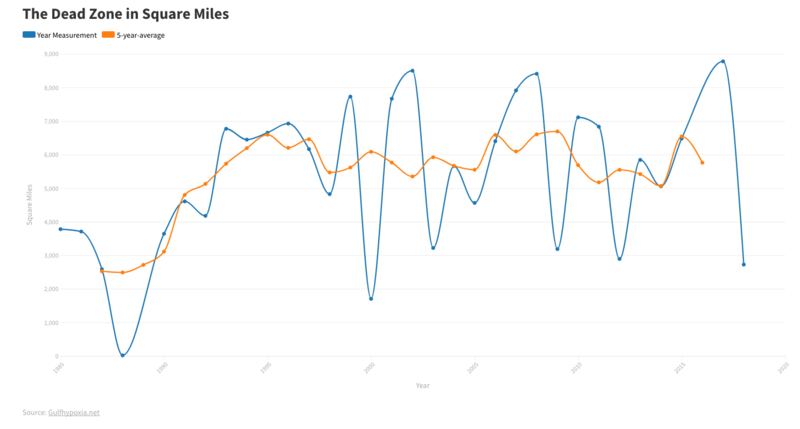 Again, the difference was the result of this year’s unusually long high-water period. 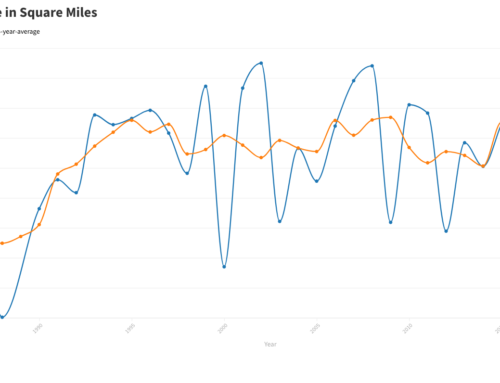 The Mississippi at the Carrollton Gage in New Orleans has been at or higher than 11 feet above sea level since mid-March, a time when the river usually is at 4 feet or lower. Heavy and steady rains throughout the watershed increased water discharge levels above the long-term average in June and to record-breaking high-discahrge levels by late July, during the cruise, the researchers said. 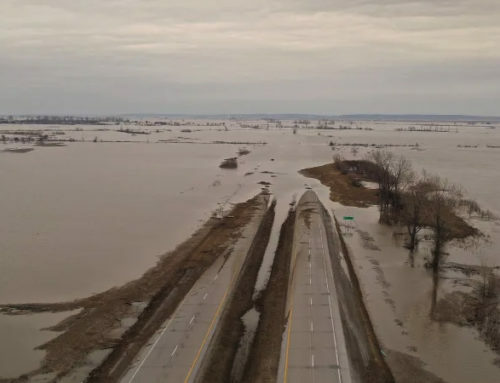 This year’s weather has been driven by a combination of El Nino conditions that have resulted in higher than normal rainfall in the upper Mississippi River watershed, and stubborn high pressure systems that have blocked the formation of tropical weather systems in the Gulf of Mexico. 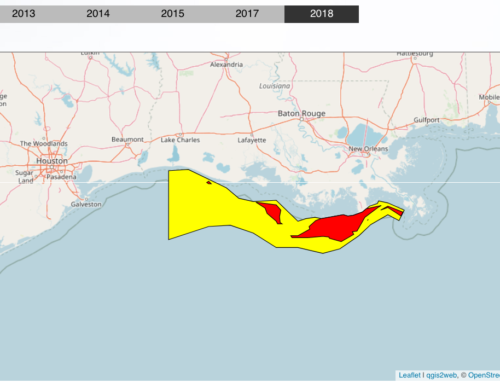 An earlier cruise, lasting between June 9 and July 5, by a team of Texas A&M University researchers identified several areas of low oxygen water off both the Texas and western Louisiana coast, including near the mouth of the Brazos River. Researchers noted that extremely heavy rainfall in Texas earlier this year resulted in major flooding in June along the Colorado, Brazos and Trinity rivers. 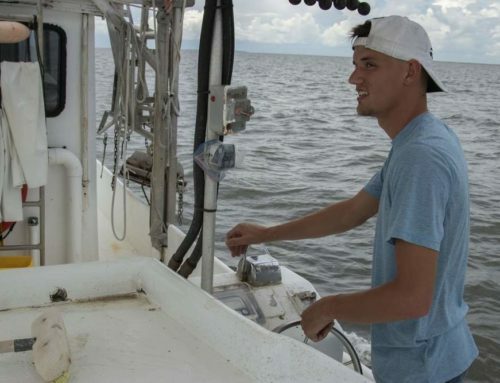 "The low oxygen off the western Louisiana shelf and the upper Texas coast dissipated by July 28, when the present cruise was conducted," said the news release from the Louisiana researchers.